At speed on the Solent August 2003 R.Hellyer. Engines: 3 x 1250hp Packard petrol eng. 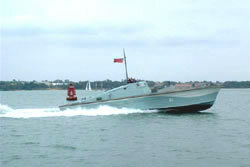 The 71½ ft design was prepared in late 1940 by George Selman, Chief Designer of The British Power Boat Co, Hythe, in conjunction with Bill Holt, RCNC, Head of the Boat Section in the Department of the Director of Naval Construction. The requirement was for a "short", fast, well armed Motor Anti-Submarine Boat (MASB), to operate in a gunboat role, to counter German E- and R-boats which, following the German occupation of Holland, Belgium and France, had attacked Allied shipping in the English Channel and North Sea. The 71V2ft hull form was almost exactly similar to the original 70ft BPB boat, but the hollow back profile of the deck was eliminated and the deck was given a hogged sheer from stem to stern. In addition, the structure was very much stronger than the 70ft BPB and no boat suffered from hull defects. The first 71½ft boats were ordered in November 1940, under the 1940 Programme. This included 24 MASBs from BPB, who allotted its Yard Nos. 1800-1823 to the batch. By the time Admiralty Numbers were allocated in January 1941, the new designation "Motor Gun Boat" had come into use and the 24 boats originally ordered as MASBs were designated MGB 74-97, MGB 81 being BPB Yard No. 1807. Of the ninety-six 71½ft BPB built, thirty-nine were Mark V - with the MGB streamlined canopy; the other fifty-seven were MkVI - with the MTB bridge. The construction was on the hard chine principle with side planking of double diagonal mahogany planking and that of the bottom being triple diagonal mahogany planking. The craft were powered by three Packard 1,250bp petrol engines with the centre engine driving directly and the wing engines using a "Vee-drive". Speed was about 40 knots maximum with 35 knots being achieved continuously and 26 knots cruising. These speeds increased about 3 knots when underwater exhausts were fitted. Fuel was carried in five tanks amidships of total capacity 2733 gallons which gave a range of 475 miles at 35 knots or 600 miles at 15 knots. The MGBs had a Type 286 radar later replaced by a Type 291, however all were fitted with W/T. The crew comprised 2 officers and up to 12 men. Armament included a single 2pdr Pom-Pom forward, a single twin 20mm Oerlikon amidships, 2 twin 0.303in Lewis machine guns on pedestals, a single Holman Projector aft and 2 Depth Charges. Armament varied however, and in MGB 81 the Holman Projector was later removed and replaced by a twin Oerlikon aft. During mid 1944 50 mark XII depth charges were carried for use against midget submarines.